I love this long, narrow horizontal format, I will be doing more of those in the future. I have only painted ginger lilies a few times, usually red, but they also come in pink and white. 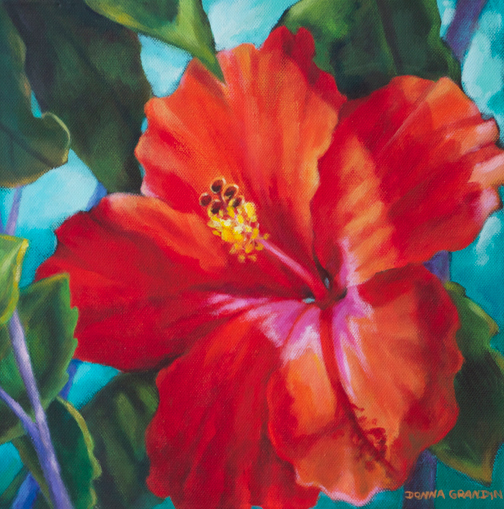 While I was in St. Lucia, I took this painting, and several others in to The Inner Gallery. 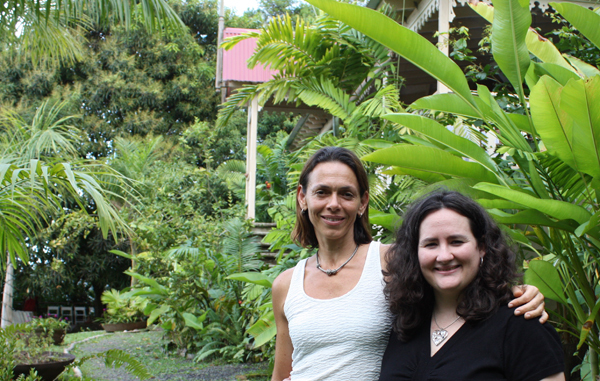 So, if you are local, ask Rachael or Chartal to see my new work. And if not, you can find contact information on the Facebook page, they ship worldwide. 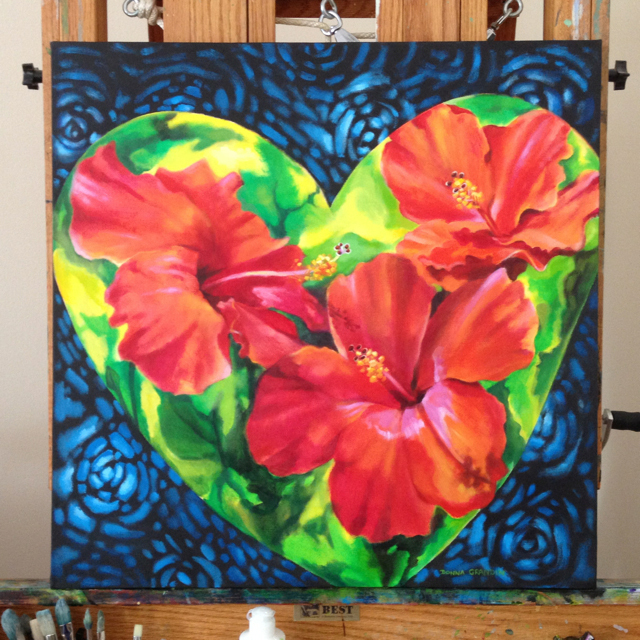 The inspiration for this painting was The Pink Plantation House Restaurant in St. Lucia. Not only is the food great there, but the setting is gorgeous. I have wandered the grounds taking hundreds, probably thousands of photographs, and done a couple paintings from them before, but I could easily do a whole show based on this location. I did not actually get there on this trip, so I thought I’d share a few photographs taken on previous visits to St. Lucia. Michelle has probably the best set-up I can imagine for an artist, her whimsical paintings on canvas, ceramics and textiles are very popular, and her creative side gets to be inspired by this beautiful, lush setting, while her family background in running a restaurant helps to balance out the business side. 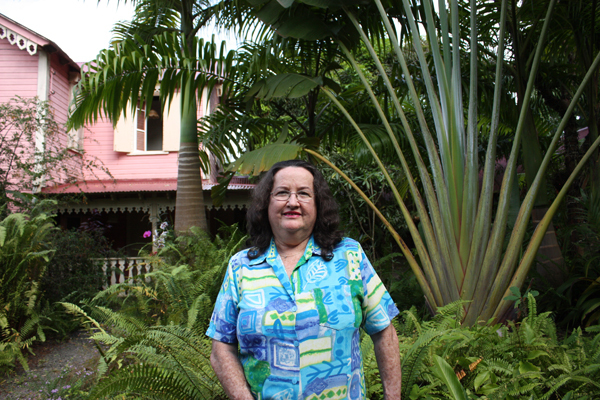 My mom, “Fancy Nancy” always wears bright, colourful prints which reflect her cheerful disposition. 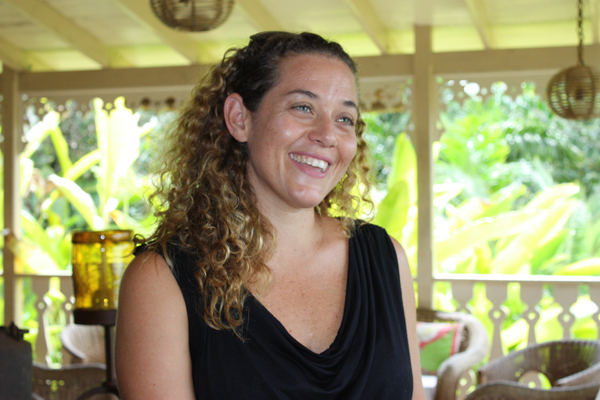 Alison – Michelle’s sister – started up The Pink Plantation House Restaurant with her, but now she has her very own cafe in a very central location in Rodney Bay, St. Lucia. I only saw her briefly this trip, but she gave me a little something for my “sweet tooth”. I took the fudge back to Canada to share with my boys, but from the first bite I knew they were out of luck. 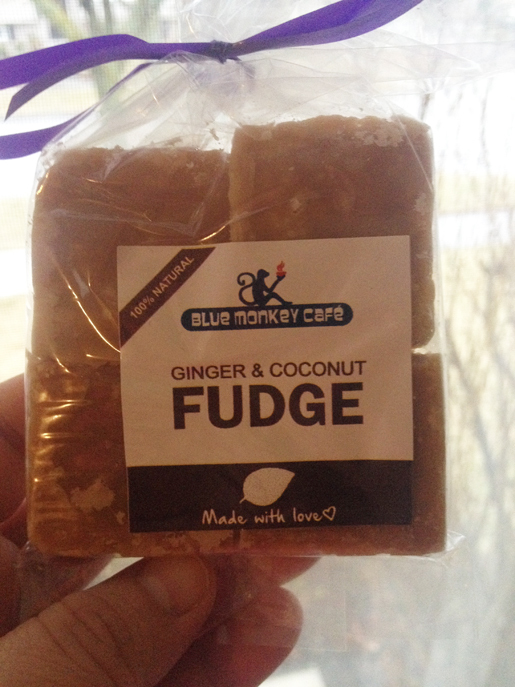 The texture, the taste, it was really good fudge. The boys were happy with the tamarind balls, guava cheese and coloured coconut balls that their granny sent for them, and I did not mention the fudge at all. But I will have to get them some next time I am in St. Lucia. Over the years, I have had a few offers to “teach” at these Paint & Sip type of events that have been popping up at bars and restaurants etc. all over the place. So far, I’ve declined on the basis that the way I paint takes a relatively long time – generally a week or two, not 4 months like a friend I sometimes paint with! Though to be fair I do get 90% of the painting done in the first 10% of the time. That last 10% though, is what makes me a professional artist. 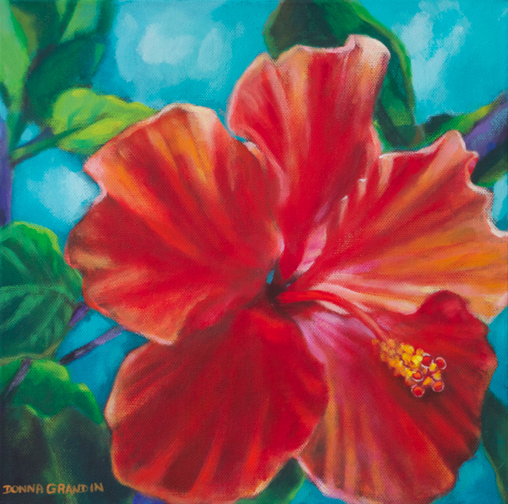 Then the opportunity arose to teach a class at Island Mix in St. Lucia, and I struggled for a whole day trying to figure out how to put 20 years of experience and knowledge about painting, into a 3 hour session, for a mix of beginners and intermediate painters. I have given art lessons before, privately or to groups of up to 4 artists, but not with the expectation of a finished painting in 3 hours. Finally it hit me, my peacock series would be perfect for this. It is fun, the process can be broken down into simple steps, and each person would be able to create their own unique image. That part is important to me. I want to encourage people to trust their intuition, to make their own creative choices, to not just have fun with the process, but to be pleasantly surprised at the art they have made. That is the whole reason my peacock feather-inspired series was born. It is the Yin to the Yang of my more realistic paintings. I love starting each painting, not knowing what it is going to look like in the end. It allows me to live in the moment, be spontaneous, try things, to listen to my inner voice, trust in my abilities. Not every painting is a winner. Sometimes the risks I take with a colour or a pattern do not work out, but not only do I still learn from those choices, sometimes magic happens! When a painting sings, and I know it would never have existed if I did not veer out of the boundries set by realism, then I feel the pride of creation. 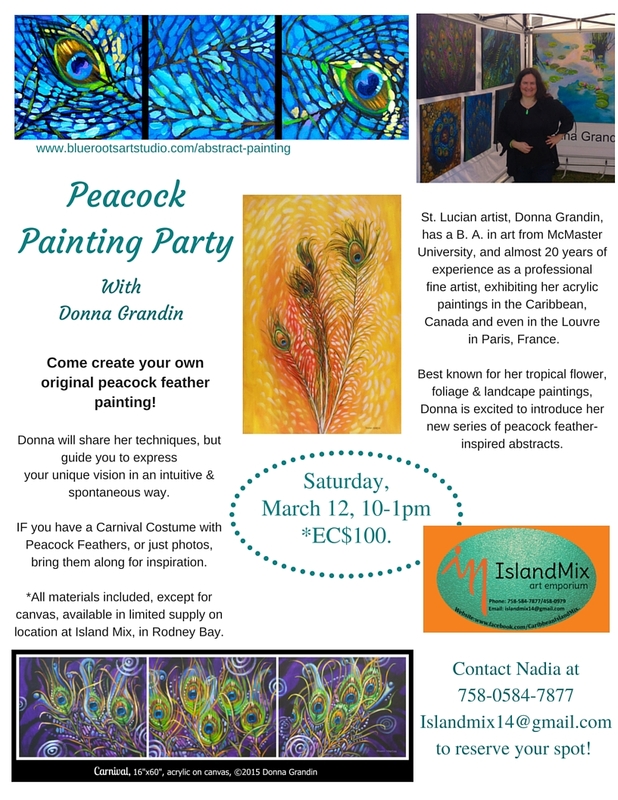 I am really looking forward to sharing my techniques with this painting party, and seeing how each person, regardless of their level of artistic experience, uses them to express their individuality! – Display your Creative side! How about a small painting for under your tree? 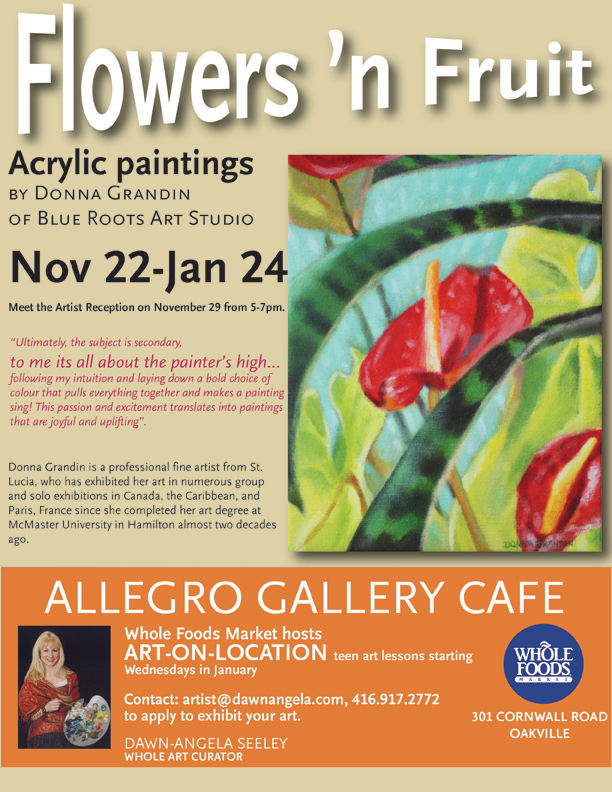 I’m happy to announce an upcoming exhibition of my acrylic paintings at Allegro Gallery Cafe, at Whole Foods Market, 301 Cornwall, Oakville. 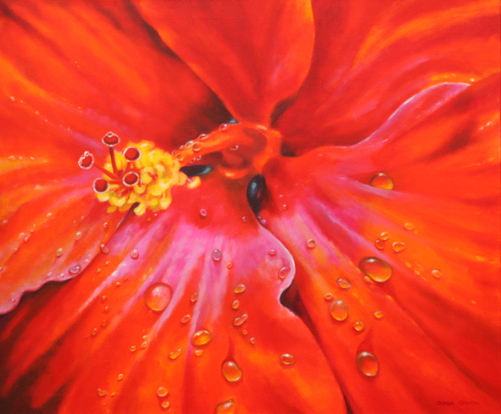 The show will run November 22 – January 24, and there will be a Meet the Artist Reception on November 29, 5-7pm. 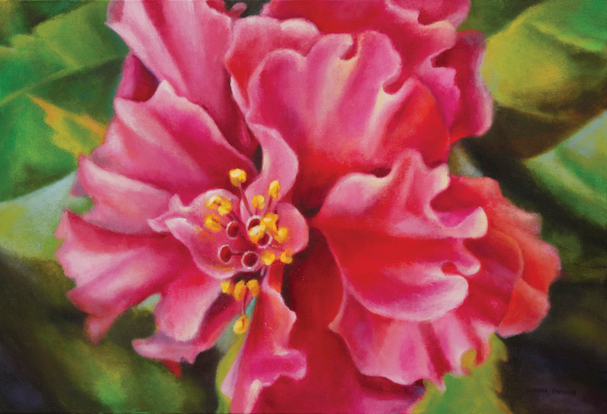 The focus of this exhibition will be on my floral and fruit paintings, nearly all of which are 6″x6″ to 16″x20″. They might not fit into a stocking, but they make great Christmas presents! Do you have a spot on the wall of your house or office that could do with a jolt of colour? Save the date! 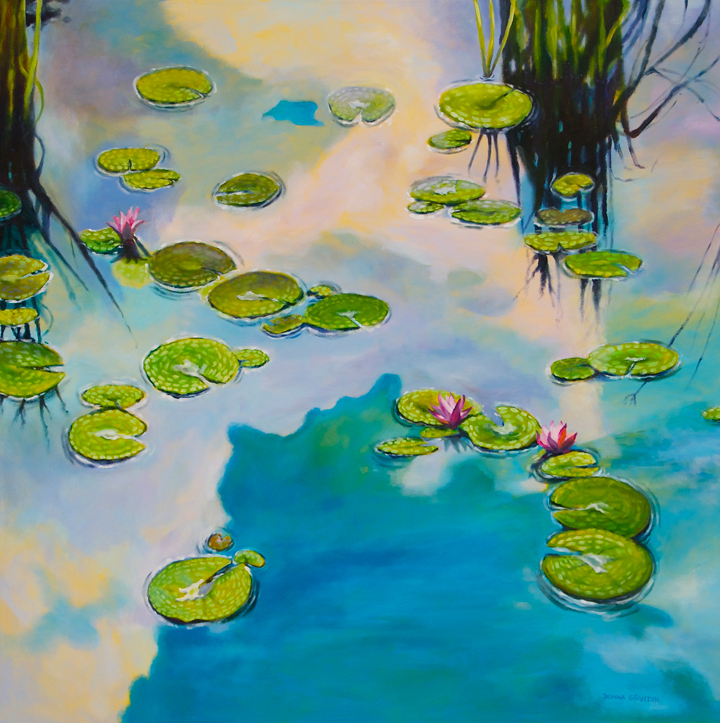 I’d love to see you at the Meet the Artist Reception. Remember to subscribe to my e-mail list for new art, exhibition invites, specials, career highlights and artistic insights. The mural I’ve been working on for the last couple months will be installed this week … more to come! 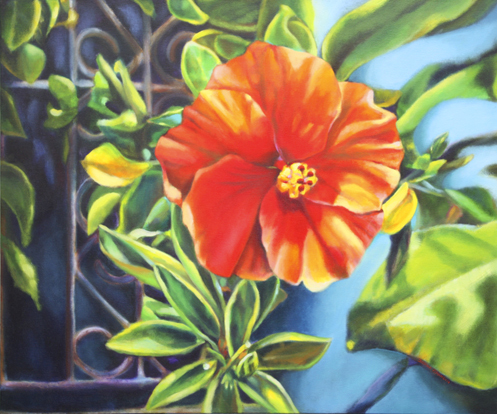 Eyecatcher, 30″x30″, acrylic on canvas, © 2015 Donna Grandin. $1400. 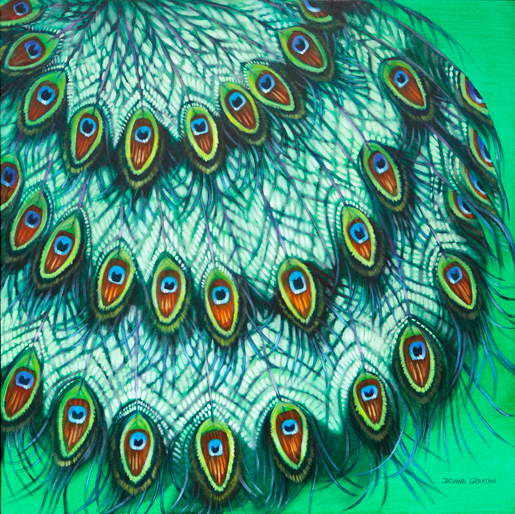 What I really enjoyed about painting this Peacock series is that while all the artworks are tied to a central motif (peacock feathers), each one – as someone remarked on Facebook today – is so “different and unique”. It’s like jumping off a rock into a river … you can keep returning to the same rock, but the water keeps flowing so the conditions are never exactly the same twice. Each painting is a result of similar, but slightly different circumstances … I might stand at the same easel, with the same paints and brushes, but now I have the experience of another painting behind me, and whatever happens to me before I come to the easel – or even while I am at it – affects my thoughts and moods, so that I am never exactly the same twice. I also like to remain flexible so that I can try out new ideas – they don’t always work out, and in fact the painting often goes through ugly stages, but as Anne, of 337 Sketch Gallery once said to me “You, will keep working at it, until it does work out”. As a younger painter, I always felt I was doing something wrong … theoretically I knew of a faster, simpler way to get an image down on the canvas, but I just could not bring myself to go that way, no matter how many times I tried … I always ended up taking the long way around. Finally, after years of painting, and having a certain amount of success, I realized that I’d been slowing myself down, fighting against my natural process. When I accepted my own way of working, instead of trying to fix it, I realized that the very things that I saw as my challenges, were what made my art interesting, because of the specific solutions I had developed to accommodate those challenges. Eyecatcher is my painting for today. I think it is the kind of image that is fun to sit and contemplate … there are all sorts of possible interpretations. What’s yours? 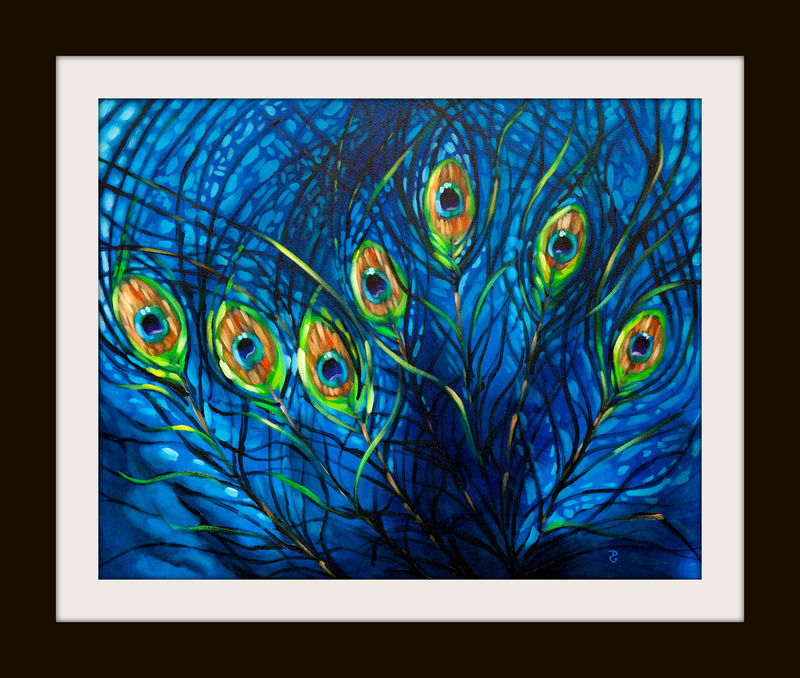 Art in the Park, Oakville – Monday August 3, 10-5pm. 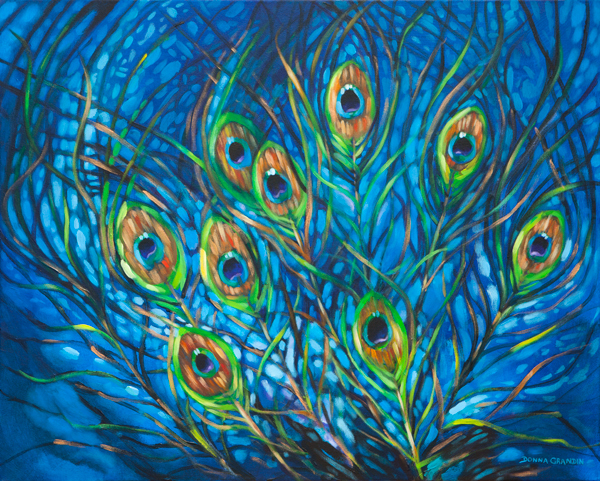 Flow, 24″x30″, acrylic on canvas, ©2015 Donna Grandin. $1200. If this painting looks a little familiar, it’s because it has evolved over the last year … it started as a demonstration, at a live painting event. You can read about it in this earlier blog post, where I even created a video to show the process thus far! The initial inspiration was a peacock feather mask that I’d bought 10 years earlier, in combination with the live music … it was the first time I painted at a public event like this (Culture Days), and the energy was awesome. In fact I had so much fun at Culture Days, I’m doing it again Sept 26 & 27 this year. More on that in another post. Although there was so much I loved about this painting, it just never felt quite finished … that could be because I’m accustomed to working a week to several weeks on a painting, so several hours of painting didn’t seem enough. And partly because although I’d designed the “eyes” as if they were notes on a music sheet, I just didn’t like the way they created a single line , pulling the viewers’s eye across the image and out. I called the painting “In the flow” originally … and for some reason, it just seemed to remain in flux, there was always something more to do to it, so in between other paintings, I’d keep going back to it. Eventually, in a new space, I decided to work on it to completion, and what emerged is this painting … “Flow”. In this version I really played on the aquatic tendencies of the original, and I’m quite happy with the result. I will be bringing it to Art in the Park Oakville on Aug 3, my booth is #143, and I hope you’ll be able to come out and see it in person! Acrylic painting classes – register now! 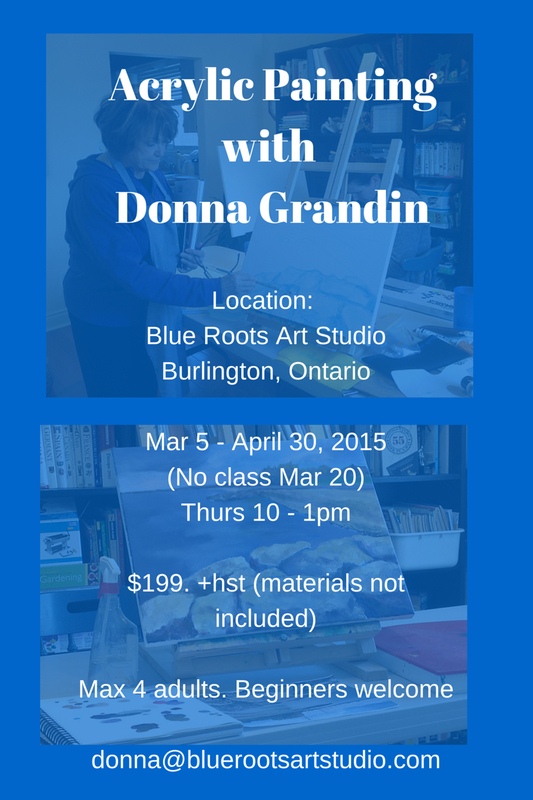 The first session of painting classes in my studio is coming to an end, so I’m offering another session, 8 weeks this time. Thursdays again, and now Sunday morning as well. Register here for Sun or Thurs classes … please indicate which day. If you have any questions, I’d be happy to answer them. I’d like to thank you all for following my painting adventures last year, and I look forward to sharing new experiences with you in 2015. 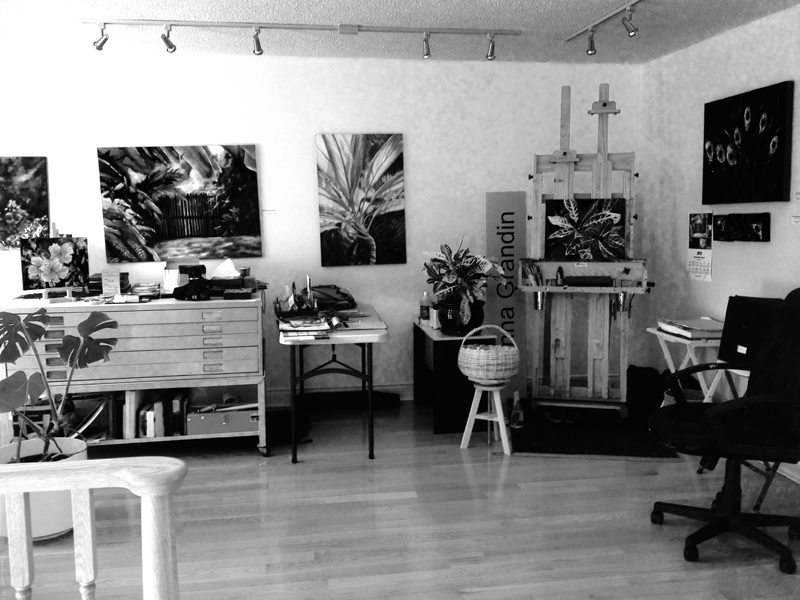 I have some exciting things planned, some I can talk about … like teaching art classes in my studio in Burlington, and some that are still hush hush. 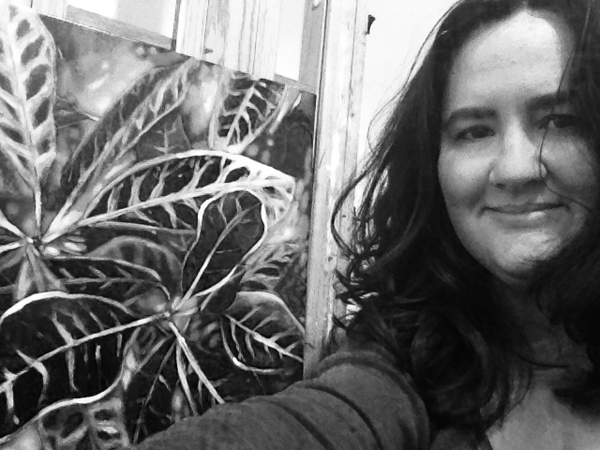 This year, I want to build a series of Fernscape paintings, combining realism and abstraction, for a solo exhibition. Since my last solo exhibition in St. Lucia in 2012, I’ve been experimenting and looking for something in my art. I’ve had some breakthroughs, and now I’m ready to work on a solid series. If the art I did before could be seen as my Sunny Tropical Foliage & Flower series, then I think you could say the work I’ve been doing lately could be seen as part of a Night Garden series. There are yin and yang forces at work here, the light and the dark, the night and the day. Somehow it feels necessary to complete the circle, to represent both sides.